(CHRIS) The boat left from a tiny landing mere yards from our tent. We felt crisp and clean after a nice outdoor hot shower and, with drink in one hand and camera in the other, we knew the fresh breezes of the river would lead to even greater adventures and longer sentences. There was room for about 30 at the tables on the boat, plus an open rooftop. However, there were only 4 or 5 other people aboard. We saw a hippo in the distance early on. We saw a beached croc a ways off, glittering in the sun. But mostly we saw the local tribespeople. They lived and farmed along the river. They raised cattle and fished from their dug-out mokoro canoes. They always had a nice smile and wave for us as we passed. 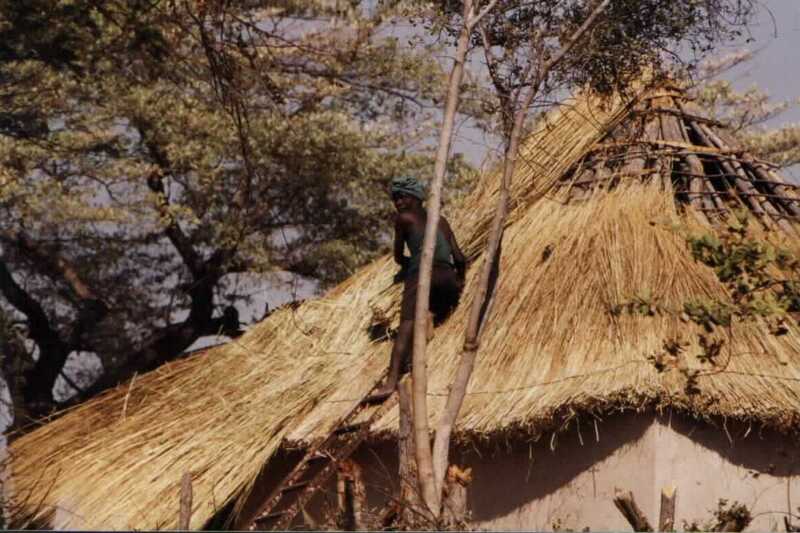 They had thatch huts and were pretty poor, but it didn’t look like they were so poor that they were starving. Thus, they seemed happy – especially the kids. Towards the end of the trip (we had gone 10 or 15 k’s upstream into Namibia – Botswana was just a few k’s downstream) we came real close to a group of about 12 hippos in the water. We never saw them full size – just their snorting noses, twitching ears, and all-seeing eyes. They splashed about but kept their distance from our large, noisy boat. They were awesome and it made us all eager to see them out of the water – in all their fat glory. The border crossing was no problem except they told us that our ostrich and jackal skulls were technically illegal aliens. So he let us hide them in the car. The Botswana countryside was pretty nice. Lots of classic African grass and scrubby trees. Again, we found the people to be smiley. We saw a truck called Obi-1 Canopy stopped on the road. Paul had met its two owners, 2 young Israeli guys last night. They were merely filling up with spare gas. They named the truck they had bought for their 6 month Africa adventure Obi-1 Canopy because they had built a metal canopy for the back right after seeing Star Wars #1. 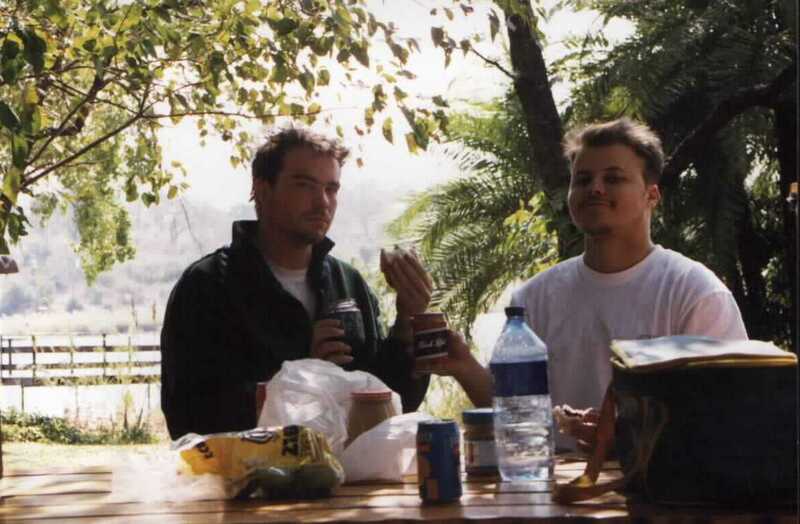 They said they would be staying in Maun at Ngepi’s sister camp – Audi – where we were headed also. The only gas on the route was Etsha 6, one of 13 towns founded for harboring refugees from the Angolan War. We found a basket shop willing to change a few US dollars and then we got gas and food. Botswana people were real nice, as their Namibian neighbors had been. We got to Maun as it got dark. We were pretty disappointed in the trafficy, dusty, dirty city. However, Audi cap was okay and we even got a site there without sand! We ate in their restaurant. I had a nice bacon cheeseburger, Sam pasta, and Paul some strange pancakes. Then we borrowed the camp’s trivial pursuit game and sat at the outdoor restaurant for the game. It was a long game, which we ended up completing in speed mode. The reason was that the questions were geared towards S. Africans, not Americans. They were a different set! Anyway, I made a stunning come-from-behind victory to beat Paul by answering that “Kiwis” was the nickname of New Zealand’s rugby team. We hit the hay just before 11pm.